In the current economy, make sure you're making the best use of your time with proven strategies that will make a real difference to your productivity and profitability. How much are your current time habits really costing you and your business? - Over 50% of IFAs have a poor work/life balance. This information packed presentation will show you ways to reduce your time wasters, deal with distractions, improve your productivity, save an hour a day, get control of your time and increase your profitability. 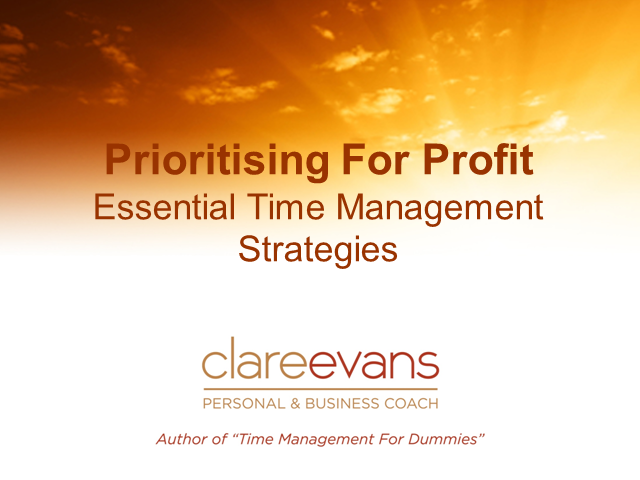 Clare Evans is a time management coach working with individuals and business owners. She is the author of the best selling "Time Management For Dummies" and she is regularly featured in the national press. To contact Clare and for more information, free resources and to register for a free Time Audit go to www.clareevans.co.uk.